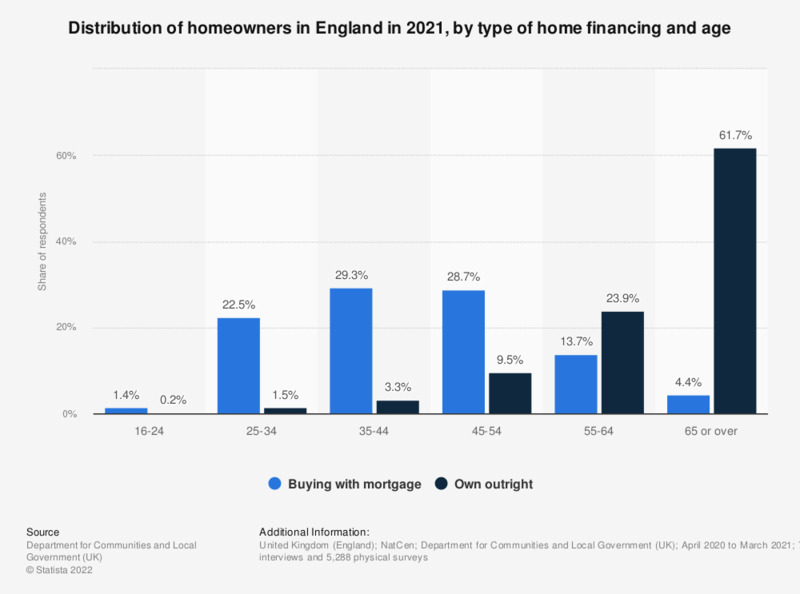 This statistic illustrates the distribution of all owner occupier households in England between 2016/2017, by age group and type of home financing. It can be seen that the older the age group, the larger the share of owner occupier homeowners who purchased their home outright. A share of 0.2 percent of own outright homeowners were between the ages of 16 and 24, whereas a share of 60.6 percent of own outright homeowners were aged 65 and over, a difference of 60.4 percent. Although this is the case, the largest share of homeowners who purchased their house with a mortgage was in the age range of 45 to 54 years old, with a share of 32.3 percent at that time.